The descriptions found in your typical dog breed handbook for any one of the herding breeds usually include some form of “not suitable for apartment living” or “does not do well in urban areas.” This is not necessarily true. I choose herding dogs as my companions, though I live in a small home within city limits. Tootsie is fine with our living arrangement. I figured out many dogs ago that providing the animal with meaningful purpose and appropriate stimulation is more important than where one lives. Doing this can be pretty simple, and certainly does not require livestock. But when your friend invites you to a dairy farm and says you can bring your dog, you don’t say no! My friend Bess called this afternoon telling me that she was going to go check on a cow who prolapsed while calving early this morning. 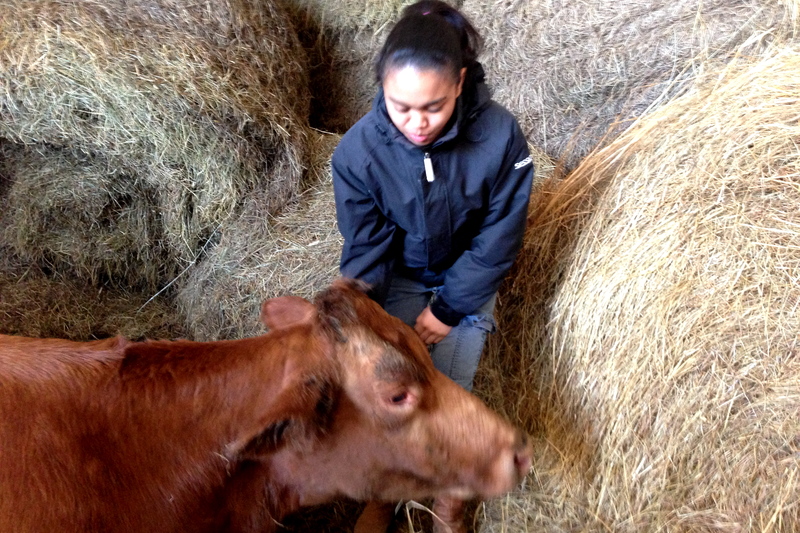 (This cow’s uterus was displaced outside of her body and had to be, well, put back inside her. For an idea of what it looks like do a google image search of “uterine prolapse cow.”) She invited me, Krystynne, and Tootsie and promised us a walk in the hayfield. After briefly pretending to consider staying home to finish some work, I called her back to let her know we would drive out to meet her. I found some worn denim and a comfortable fleece in the back of my closet and put on a pair of boots. Krystynne did the same. Tootsie watched in anticipation. We took the car to meet Bess, and followed her down an old gravel road. After a few curves and more bumps than I could count, we came to the barn area. There we met Dot, the cow. The dairy heifer looked tired. Krystynne and I watched as Bess worked. Dot was offered water and another liquid, turquoise in color, full of vitamins. She drank, but not enough. She was encouraged to stand, but she didn’t want to move. (I was told that getting her up and moving would be the best thing for her.) We resigned to simply offering her comfort. A good scratch under the chin was appreciated. I think Bess could tell Krystynne and I were upset with Dot’s lack of improvement, and so she distracted us with adventure. We drove further into the property and stopped at a dilapidated wooden house that sat on a stone foundation. Not much was left of the 19th-20th century homestead, but Bess wanted some of its weathered wood for a sign she was making. We walked through the house, doing our best to not concentrate our weight on to any one point; we didn’t want to end up entering the crawl space through the living room floor. Bess found a teal colored board, and Krystynne found a collection of glass bottles from the prohibition era. Then, we drove up to the hayfield. We walked with the dogs–Tootsie and Bess’s chocolate lab, Bear. 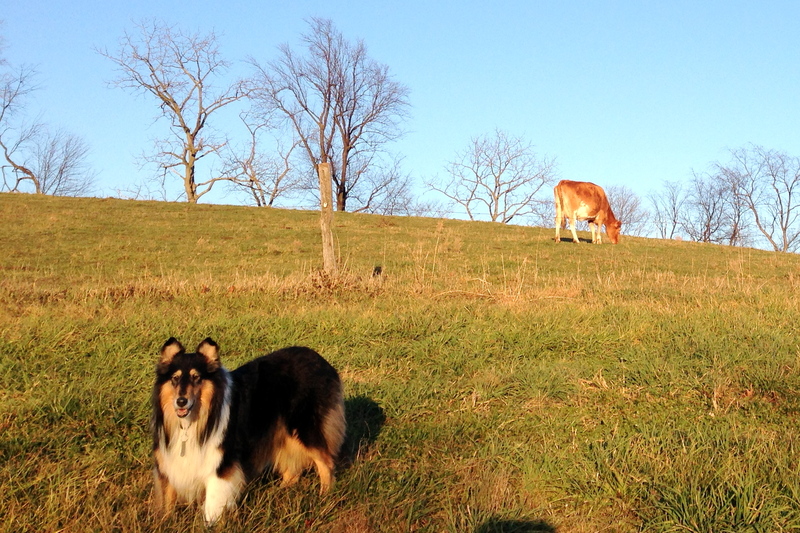 There were cows in the next field over when we started our walk, but Tootsie was too focused on us to notice. As we settled in to the walk and Tootsie realized she need not focus all of her attention on the humans, she explored. She found the innards of a recently gutted deer. And a few burrs found their way into her coat. The scenery was beautiful, and Tootsie looked like she was exactly where she was meant to be. Tootsie waiting for the release. I wasn’t thinking about it at the time, but the dance we did in the hayfield with the cows was a symbol of how far we’ve come together. Tootsie and I are a team. Now, after a plate of Thanksgiving leftovers, I write this post. From my office, I can see Tootsie curled up next to Krystynne on the couch. They both look content.